How socialist democracy can protect the gains of the Cuban Revolution. The victory of the Cuban revolution in 1959 and its subsequent radicalisation had a direct impact in the advanced capitalist countries. The expropriation of nearly all national foreign capital, the proclamation of socialism, the anti-imperialism and initial support for challenging for state power with armed struggle in Latin America all inspired activists here who had been involved in the Campaign for Nuclear Disarmament and then Vietnam Solidarity. It made the idea of socialist revolution real in countries like Britain still experiencing the post-war boom. Revolutionary Marxists, anti-Stalinists, like Ernest Mandel, could visit Cuba to listen and debate. Of course the established revolutionary groups responded in different ways. On the one hand there were forces who recognised that a real socialist revolution was taking place. Capitalism had not been overturned as a result of Stalin’s red army of occupation as in countries like Poland or Hungary after the Second World War. It had been a revolution massively supported by the people and led by non-Stalinists. Indeed recognition of this historical reality allowed two wings of the Trotskyist movement of the time (the Mandel Europeans and the Hansen Americans) to re-unify. On the other hand you had revolutionary groups which we could call sectarian/ultra-orthodox Trotskyists who adopted a position that because the Castro group fused subsequently with the Cuban CP then it was just another Stalinist managed process and in some way not a real socialist revolution. A variant of this position would be to define the Castroists as declassed or petty-bourgeois intellectuals who then established a form of state capitalism – the forerunners of the today’s SWP, the International Socialists, broadly had this position. So for people new to revolutionary or radical politics Cuba was very important. Che Guevara courageous efforts to form a revolutionary liberated zone (foco) in Bolivia consolidated this effect but also pointed to some of the first difficulties with focoism. Certainly there were serious errors made in trying to replicate what was possible in Cuba in 1959 with the different political and social conditions in other Latin American countries. Trotskyist groups in the area like the Argentinian PRT were destroyed both physically and politically as a result of an ultra-left armed struggle tactic. European co-thinkers supported this line for some years before rectifying it. Today the debate has moved on considerably as Cuban politics and society have experienced over 50 years of the US imperialist blockade, the impact of Soviet ‘cooperation’ and then the subsequent trauma of the sudden withdrawal of Soviet aid with the fall of the Berlin Wall. Currently the CP leadership and the people are preparing for the biological demise of the Castro leadership and the pressures from Florida based Cuban capital and the Sino-Vietnamese model of bureaucratic capitalism. Once again the response of socialists here to this crisis varies. There are some who say that the main task is to be in solidarity with the Cuban people and its leadership against the pressure of the US blockade. They say it is not our task to give recipes for change from a comfortable position which does not take account of the dire economic problems or the huge threat of the US. Others, and Samuel Farber fits into this category, suggest that you can support the Cuban people against imperialist threat but we have to raise the issues of socialist democracy and an anti-capitalist programme if there is to be any chance of protecting the gains of the Cuban revolution. This means also supporting those struggling to end the single party system and the poor human rights situation in Cuba. Indeed the analysis in the book about the importance of supporting a multi-party system, the right of faction and tendency in the Cuban Communist party and truly independent mass organisation is crucial for eminently practical reasons such as improving productivity or undercutting the arguments of the right wing, pro-capitalist or social democratic forces that are becoming stronger within Cuban and in exile. This analysis is particularly relevant today in Britain where the issue of internal revolutionary democracy has emerged with a vengeance inside the British SWP. 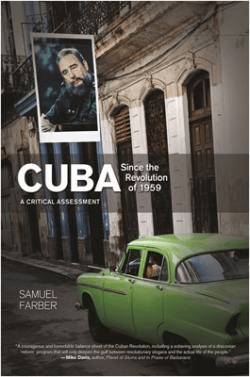 Even for people who thought they knew quite a lot about Cuba Sam Harber’s book is a mine of new information and insight. For example the chapter on foreign policy traces in detail its contradictory nature. At the beginning even while supporting armed struggle movements the Castro leadership were always very politically soft in relation to the Mexican or Spanish governments. This was at a time when hundreds of Mexican students were massacred in 1968 and when Franco was still executing oppositionists. Later when the main area of intervention was in Africa Cuban soldiers heroically defeated the Apartheid army in Angola but in the same period militarily supported the Ethiopian government against the Eritrean people. There is a wealth of detail in the chapters on gender and black people to show how the Cuban leadership eventually adopted a conventionally Stalinist approach. The logic went that independent organisation of women, blacks or gay people under socialism was a division of the class and of course this class was now in control of society. Since the party solely represented the class any independent organisation on gender lines would weaken this leadership. Interestingly he shows that although women were not allowed to have any self-organisation independent of the party they did relatively gain many more rights than gay people. Even Raul and Fidel Castro have now half-heartedly accepted that the treatment of gay people was not correct and there has been significant change in this area. One of the best chapters is the one on dissidents today in Cuba and in exile. Like it or not some of these political forces may play a role in any post-Castro transition so it is important to understand their political positions and potential. Furthermore Farber correctly identifies forces within the bureaucracy such as managers of key economic sectors like tourism or biomedical goods and the military cadre who run the army enterprises as the possible political and social layers to lead a transition towards a Sino-Vietnamese solution. Although he suggests this is perhaps the most likely outcome given the present relationship of forces he also discusses those anti-capitalist socialists who are doing the best they can to forge an alternative to neo-liberal, social democratic or Chinese approaches to the transition. They deserve our support and solidarity. 2 Comments on How socialist democracy can protect the gains of the Cuban Revolution. Thank you for your comment Dave. I did indeed read Louis Proyect’s review, alongside a review by Jacqueline Mulhallen on the Counterfire website. The latter was much more positive than Louis’s piece but in the final paragraph argues that Farber does not explain how the system will be changed from below and is pessimistic about the workers ability to achieve this because possibilities for organising have been closed down. In fact Farber gives quite a lot of space to what you might call dissidents from the left and what they are doing. True he feels it will be difficult given the depoliticisation and scepticism among particularly younger people but he does not suggest in any way that this struggle is a waste of time. He does have a political judgment that points towards a probable sino-vietnamese transition. However while Jacqueline accepts the overall analysis of the book and welcomes the additional material it provides for people in solidarity with the Cuban people, Louis is extremely negative to the book, spending a lot of time disputing details and facts concerning sources regarding the Matos and Oscar Lewis’s case. However even if you accept that Farber has made errors on these issues (I am not in a position to pronounce on that, it would take more time) it does not really take apart the solid theoretical and analytical framework underpinning the book. Farber’s whole approach is based on a classical marxist method, relating the key issues of socialist democracy inside and outside the party and the importance of independent self organisation to both Leninist and other sources through the 20th century. Proyect derides Farber for calling Cuba totalitarian. However Farber clearly distinguishes Cuba from Stalin’s gulags or from the East European regimes structurally assimilated to the Soviet Union in the post-war period. He also recognises the popular mobilisation and support the regime has enjoyed (although in recent years this has declined significantly). His use of word totalitarian applies to a political system that denied any tendencies inside the party, refuses a multi-party democracy and does not permit self-organisation either in the unions, for women, gays or black people. Nobody can deny that this is the reality. Even the way that the Cuban CP involved tens of thousands of its citizens through amendments or questions at the recent congress is not a true democracy but as Farber adroitly puts it, like a massive suggestion box that a private or public sector employer might organise. Where Farber is most relevant is the way he relates issues of socialist democracy to the practical questions of economic organisation and productivity or the very survival of non-capitalist property relations in Cuba. In other words unless you have a democratic socialist alternative based on real mobilisation the sino-vietnamese transition is the most probable. It is quite possible to unconditionally defend the Cuban people against the US blockade and against the Miami right wing while at the same time not suspending our ability to honestly analyse politics and society from an historical marxist position. I think Leo Panitch’s comments in a recent interview are pertinent here. People who are defending socialist ideas inside Cuba don’t just want cheerleaders for the regime against the US. They want to share our ideas and our difficulties about devising an alternative to capitalism and its stalinist totalitarian twin.